This portion of the collection includes 20 patterned papers (and 5 bonus solids!) Love the papers? Check out the page kit where you can get find them bundled with the coordinating pretties! 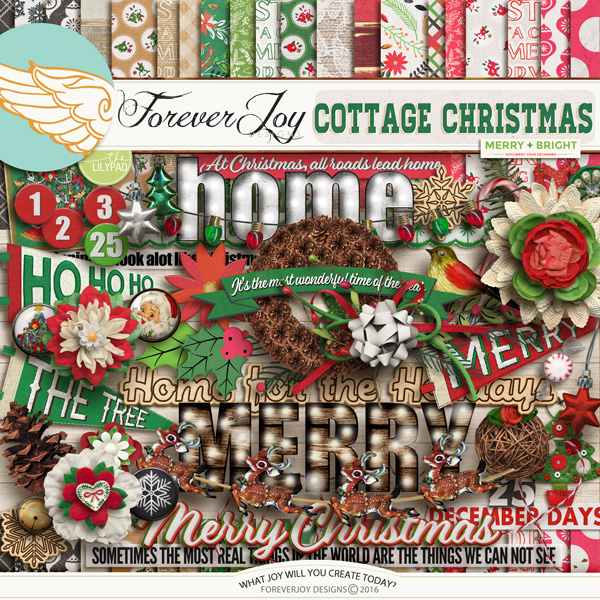 The Cottage Christmas page kit includes 18 patterned papers, 5 bonus solids and the following pretties: a set of countdown numbers 1-25, 2 berry branches, a little winter songbird, 3 bows, 5 brads, 3 buttons, 1 vintage card, a pinecone wreath, a candy cane and candy peppermint, colored doily, 6 flowers, 2 holly leaves, a kissing ball, a journal label colored 3 ways, a strip of lace, colored lights on a string, 2 pieces of "lit" marquee word art, 3 ornaments, 3 felt pennants, 2 pine branches, a pinecone, a string of reindeer, 2 veneer snowflakes, a curl of bakers twine, 4 pieces of washi tape, 10 pieces of Word Art. *not all items are shown in preview. This item coordinates perfectly with the other 2016 DYD products! Drop shadows for illustration only. This digital kit has been saved as .png files at 300 dpi. Not all items shown. Personal Use Only please. This item coordinates perfectly with the other 2016 DYD products! Drop shadows for illustration only. This digital kit has been saved as .jpg files at 300 dpi. Not all items shown. Personal Use Only please. This item coordinates perfectly with the other DECEMBER 2015 BYOC products! Drop shadows for illustration only. This digital kit has been saved as .png files at 300 dpi. Not all items shown. Personal Use Only please. This portion of the CABIN FEVER collection includes 20 patterened papers (and 4 bous solids!) that coordinate beautifully with the CABIN FEVER pretties. Layouts on this page show the Papers and together with the Pretties which can be purchased separately here. This item coordinates perfectly with the other DECEMBER 2015 BYOC products! Drop shadows for illustration only. This digital kit has been saved as .jpg files at 300 dpi. Not all items shown. Personal Use Only please. Celebrate the joy your best friends bring to this season with this bright happy design filled with sweet pups and holiday cheer! 22 Patterned papers and 4 bonus solid papers and the following pretties: 3 arrows, 2 bones, 2 bows, 7 brads, 2 buttons, 2 candy canes, chevrons, a string of lights, 2 Christmas trees, a dog tag colored 2 ways, 2 dymo tape strips, 2 flairs (naughts and nice) , 4 flowers, 2 fabric yo-yo flowers, 2 package bows, a stack of gift boxes, a felt heart, 2 holly leaves, a journal strip colored 2 ways, a paper lace strip, 2 dog leads, 2 Christmas ornaments, paw prints, a pine branch, 5 various dogs, a strip of ribbon, 2 snowflakes, a tassel, a curl of bakers twine, 2 vellum word spots, 3 strips of washi and 13 pieces of Word Art. Drop shadows for illustration only. This digital kit has been saved as .png files at 300 dpi. Not all items shown. Personal Use Only please. Celebrate the joy your best friends bring to this season with this bright happy design filled with sweet pups and holiday cheer! This portion of the "SANTA PAWS" collection contains 22 patterend papers and 4 bonus solid papers- The layouts you see here show the papers playing well with the coordinating Pretties which can be purchased together with the papers as a kit here. Drop shadows for illustration only. This digital kit has been saved as .jpg files at 300 dpi. Not all items shown. Personal Use Only please. Drop shadows for illustration only. *Previews may show pieces of this element pack combined with the coordinating Page Kit shown below. It's not really about what you see- but how you choose to see it! Look beyond the dreary cold and choose to color your winter memories HAPPY with this cozy design by ForeverJoy- you'll find it's bright colors and knit patterns will bring out the joy in your cold weather memories! Some like it HOT for the Holidays- and this page kit has all to capture that Holiday Spirit in a fun festive style! Here's what you'll find inside! Drop shadows for illustration only. This digital kit has been saved as jpg and .png files at 300 dpi. Not all items shown. Personal Use Only please. Some like it HOT for the Holidays- and this paper pack filled with pink and greens, palm trees and flamingos helps capture those sunny memories! Like the papers? Be sure to check out the full design shown below by clicking HERE. Capture the charm of busy sidewalks dressed in Holiday style with this retro themed playset that includes 11 papers and over 35 elements including 2 bows, 3 buttons, a sweet candy cane, a Holiday cab, a string of lights, 2 Christmas trees, 3 flairs, 5 flowers, 2 frames, 2 journal spots, a little city pigeon, 2 ribbons, 2 snowflakes, a row of 3 city homes, 2 poinsettia stickers, a street lamp, a Holiday tag and ticket, a traffic light blinking Holiday colors, a 4 pieces of word art. Celebrate to joy and beauty of the Holidays in retro woodland style with this page kit packed with pretty red cardinals, natural elements and soft Kraft styled papers. Incuded are 16 kraft styled papers, 2 pieces of twine, 1 plaid banner, birch trees, beads scatter, 2 flower gems, 2 sweet woodland birds on chipboard, 1 hand painted cardinal, 3 bows, 2 colored twigs, 4 buttons, 2 charms, 1 striped candy cane, chevrons, cardinal printed doily, 1 envelope, 1 tiny star scatter, 2 Christmas trees, 1 envelope, 4 flairs, 4 flowers, 3 frames, 1 Santa button, 1 star garland, 3 pieces of washi tape, 1 bunch of Holly, 2 journal spots, 3 colored labels, 2 clusters of colored leaves, 4 pieces of label tape, 1 string of colored lights, 2 hanging ornaments, 3 bits of ribbon, 2 scalloped borders, 3 snowflakes, red petal flower, 2 paint splatters, 2 retro stars, 2 swirls and 6 pieces of Wordart. Drop shadows for illustration only. This digital kit has been saved as .jpg and .png files at 300 dpi. Not all items shown. Personal Use Only please.